"Antique" teacup or bowl - how old? This one I also bought at auction, but this time it was in fact represented as being antique. 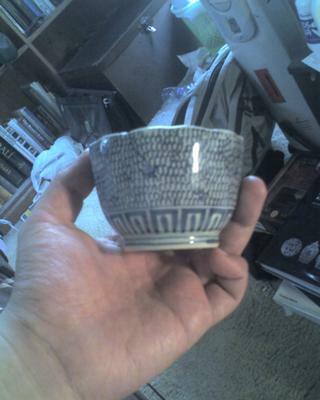 It is a dodecagonal teacup of fairly thick body but good resonance. The outside is decorated with a pattern that puzzles me - it looks like dragon scales or fish scales, scattered here and there with what looks like little fan-shaped flowers. The inside has a simple grass-like decoration. Now, I know the mark is of Chenghua and that this is impossible. But is it OK for me to assume that this is a piece from the 19th century? Or should I assume it's brand new? Also, is the pattern of dragon scales?? 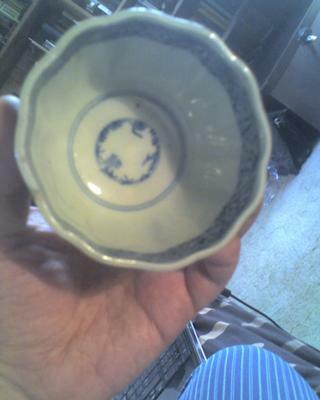 Comments for "Antique" teacup or bowl - how old? Hi, I think you already thought of most possibilities, but I will give you two or three more points. To me the bottom looks too new. Most Ming items don't look that way. As you already said, it must be newer. Further, the wave-shaped top rim appears mostly on export porcelain and is less frequent in porcelain made for use in China. The bottom decoration is a stylization of flower petals (lotus petals, I believe). I have some doubts about this shape appearing in the Ming dynasty, and that the petals are separated. The original shaped petals, at least, were not separate anymore after the Yuan dynasty. So, is it Qing, modern or ...? 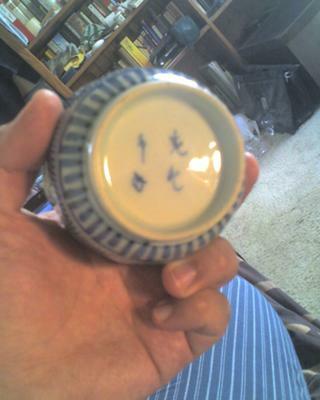 I think I see more of Chenghua marks on Japanese porcelain than on Chinese ceramics. And, the pattern would also be possible, including the decoration inside.